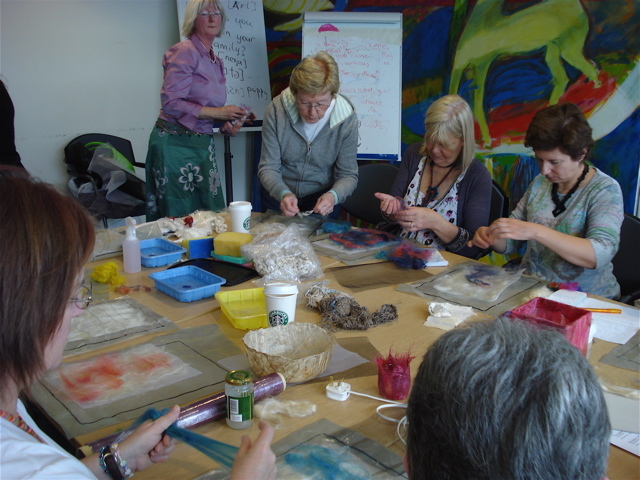 We’re back with another season of fantastic sessions on Feltmaking. All are welcome and we encourage new and experience crafters to come. Meetings take place at the Blanchardstown Library on the 2nd floor from 10:00 am to 1:00 pm on Wednesdays. These times are meant to challenge and teach us to be better Feltmakers. It’s also a time to show what you’ve created and share how you did your techniques. Bring your gear and try out new things each month. Although the sessions are free, we will have a place for donations for fibre and materials used that day. Have a great time! We kicked off with our first session on September 17th 2008 – Mini Projects 30 Minute Felt These are things that can be done as quick gifts or activities with kids. Keep an aye on our “Drop In Sessions” page for dates, locations and topics covered. Looking forward to seeing you.